This lead and halter set is being modeled by Coco, who is working toward a career with the Ford Agency. 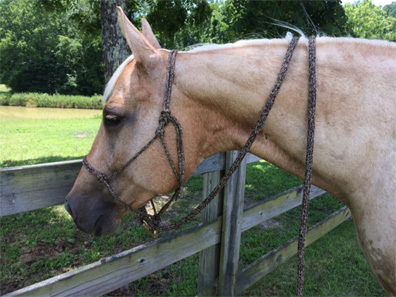 Coco is wearing an average horse size black/brown/tan halter with matching lead rope. The lead rope is costructed from high quality 9/16" double braided polyester yacht line. This hand made piece is equipped with your choice of snap at one end and a premium leather popper at the other. Combined with a top quality hand tied rope halter, this is perfect for beginner or experienced trainer. The lead is available in a choice of 20 colors and the Halter is available in stiff or soft and choice of colors. This lead rope and halter are identical to those sold on the top trainers’ websites but at a much more reasonable price. NOTE: The option "color" relates to Lead color, = When choosing halter color and style (soft or stiff) please select N/A under the color of the Halter you DO NOT want. For instance, if you want a black soft halter, make that selection and then choose N/A under the stiff halter option.